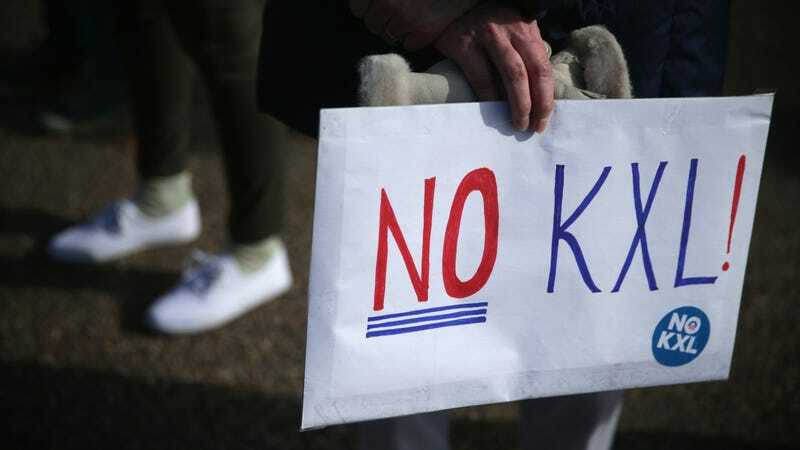 Construction of the Keystone XL Pipeline is set to begin in 2019, but before then, the public has a chance to comment on the new environmental assessment that the State Department released Monday. And so far, some tribal members and groups aren’t loving its conclusion that the pipeline would have minimal impacts on land, groundwater, and environmental justice. The federal government has taken a second stab at the environmental review process after President Donald Trump’s commitment to pushing through the crude oil project as well as the new route the Nebraska Public Utilities Commission approved last year. That route—dubbed the Mainline Alternative Route—follows the already-existing Keystone Pipeline more closely. The assessment says that while there’s potential for oil spills, the developer has response plans in place to prevent any environmental damage. However, the original Keystone Pipeline spilled more than 400,000 gallons of oil last year. Overall, the 300-page assessment makes the project sound like a net positive with minimal downsides for the communities that would live near it, including the 67 Native American tribes. And that’s what opponents of the pipeline have taken issue with. “Here’s the largest aquifer in the world, and you want to put crude oil in it and consider it a minor impact?” Chandra Mechelle Walker, a member of the Omaha Nation in Nebraska who chairs on the state’s Native Caucus for the Democratic Party, told Earther. She’s talking about the Ogallala Aquifer, which covers more than 170,000 square miles from South Dakota all the way to Texas. The underground natural reservoir provides water for an estimated two million people, as well as 20 percent of the wheat, corn, cotton, and cattle the U.S. produces. Overuse is already threatening the aquifer and its water quality. Any contamination would just worsen that. The assessment said the State Department reached out to all 67 tribes along the proposed route to include their perspectives. However, the report said only two responded to these consultation requests. Nicolette Slagle, the research director and deputy director at Honor the Earth, said other pipeline project developers have used loose language around tribal consultation. But sending a letter or making a call doesn’t count as tribal consultation, she told Earther. Tribal consultation means holding community meetings on the reservation and meeting with community members and tribal leaders. Walker was also concerned tribes weren’t properly consulted. She pointed to the Ponca Tribe of Nebraska, one of the 67 tribes with land along the route, which put out a resolution last year against the pipeline noting its alignment with other First Nations in the U.S. and Canada. Though the report found 30 archaeological sites and four properties of cultural significance to indigenous peoples, Slagle wouldn’t be surprised if there were more. She also said it’s not individual sites that matter to tribes. These protests date way before President Trump. This was in 2014 under Obama. Much of the land along the Keystone XL proposed route through holds cultural significance to tribal members, but there’s no way for them to measure that in a way the federal government will recognize. Former President Barack Obama rejected the project before leaving office, which offers a little bit hope amid this chaos. If environmentalists won this battle once, perhaps they can win again even if the Trump administration has made its stance on oil and gas development pretty clear. The State Department will soon open a 30-day public comment period for this environmental assessment. Indigenous opponents will have theirs ready.